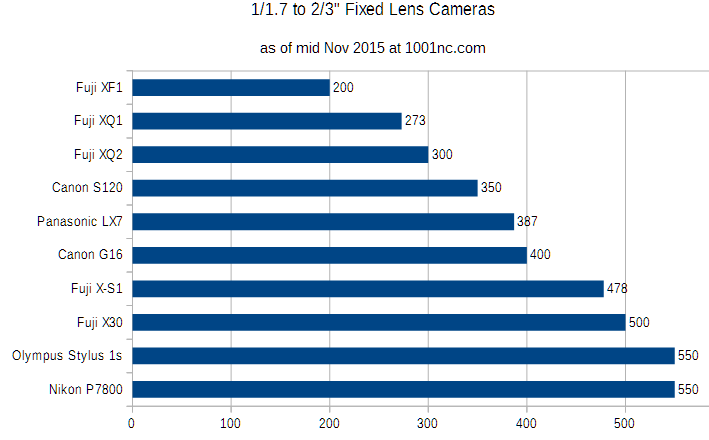 We conclude this round of Price Charts by taking a look at Fixed Lens digital cameras that support RAW out of the box, with sensor sizes ranging from 1/2.x” to 35mm full frame. 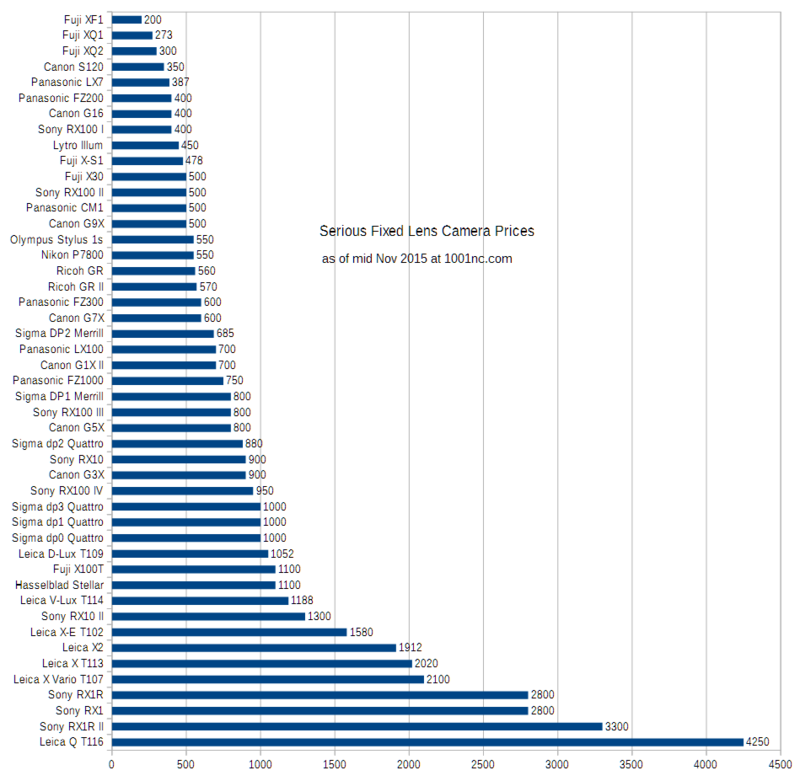 In the previous installments, we covered a snapshot of the prices of 35mm Full Frame Digital Cameras, and then APS-C dSLRs and Mirrorless cameras. 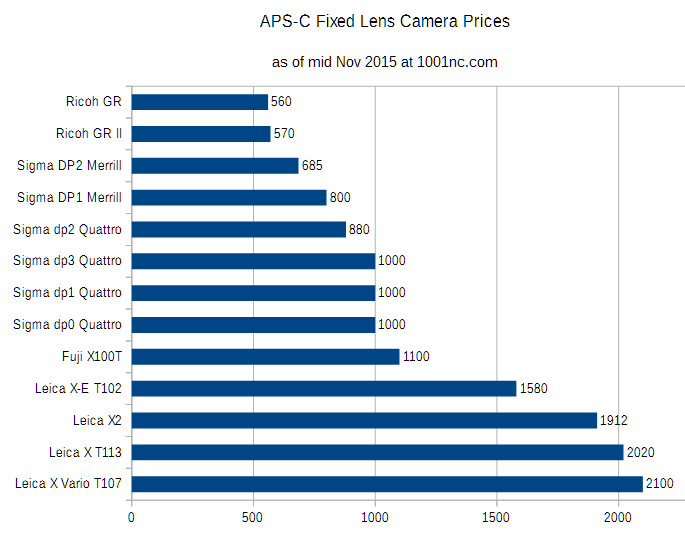 The prices are the consensus prices between Amazon and B&H Photo and Adorama as of November 20 in 2015. These are new condition with USA warranty prices, from authorized dealers. There are no mail-in rebates this time around. Older cameras that are no longer available in new condition with USA warranty from the above retailers are not included. For all the charts below, click on the image or open in new window/tab to see the pictures at full screen size (the blog-window has a maximum window size that is smaller than most of the charts). 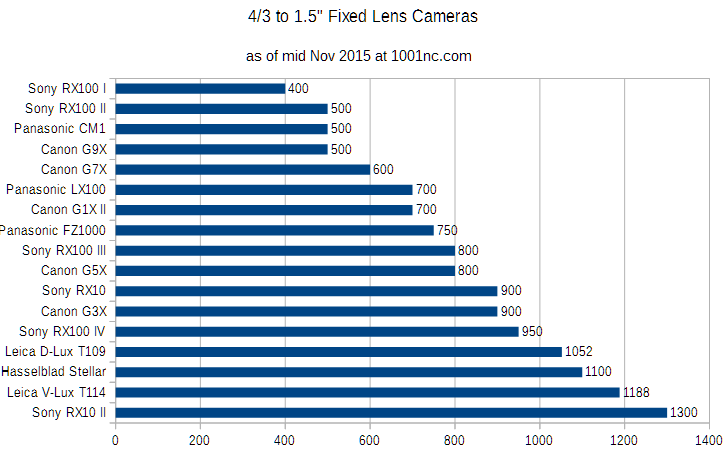 The most action this year is happening at the M43rds to 1.5-inch sensor size segment, with Canon making an aggressive push into the segment with multiple models, Sony continuing to build up, and Panasonic coming up with an Android-cameraphone creature. The APS-C sensor-size segment is kinda sleepy these days, with the Fuji X100T running almost uncontested in a sea of older models and niche Leicas and Shigumas. Once upon a time this sensor-size segment was the center of the attention of the digital camera world. Now, with larger sensor prices being a lot more affordable, this segment is getting squeezed, but it’s not done with yet. Not so long ago Olympus released the Stylus 1s (not plular, that’s the name). And now the big family picture, this includes the cameras shown above, but also cameras with 35mm full frame sensors, and cameras with tiny 1/2.x” sensors, and the Lytro Illum too. This is a huge chart below, open in new tab/window or click on the picture to see at a larger size.